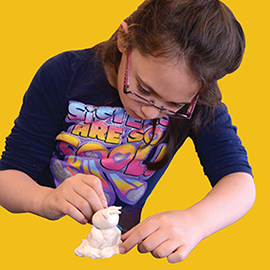 Students discover the magical qualities of clay while hand-building whimsical animal sculptures, coil pots, slab plates, bowls, and so much more. Each week students will have fun as they sue their imagination, learn technical clay skills and create. This class is for children 4 – 6 years of age. For more information please contact Jessy Mendez via email. Vicky Youngman has worked in health care settings as an art therapist, administrator and educator for over 23 years. She has taught art therapy at the graduate, undergraduate and continuing education levels at School of Visual Arts in Manhattan, The College of New Rochelle and Pratt Institute in Brooklyn, NY. In 2008, Vicky became a professional teaching artist through ArtsWestchester and conducts ceramic art residencies in public schools and community settings with children, adults and seniors in Yonkers, White Plains, New Rochelle and Mt. Vernon. As well, Vicky teaches children in preschools, after school programs and summer camps (for Clay Art Center in Port Chester and RiverArts in Westchester). Vicky has been on the faculty at Pace University in Pleasantville, NY since 2011 where she taught college students sculpture and ceramics. Vicky also facilitates teacher training workshops through organizations such as WESTCOP, and leading workshops at The Hammond Museum, The Hudson River Museum, Blue Door Gallery and through ArtsWestchester’s Free Arts Days.